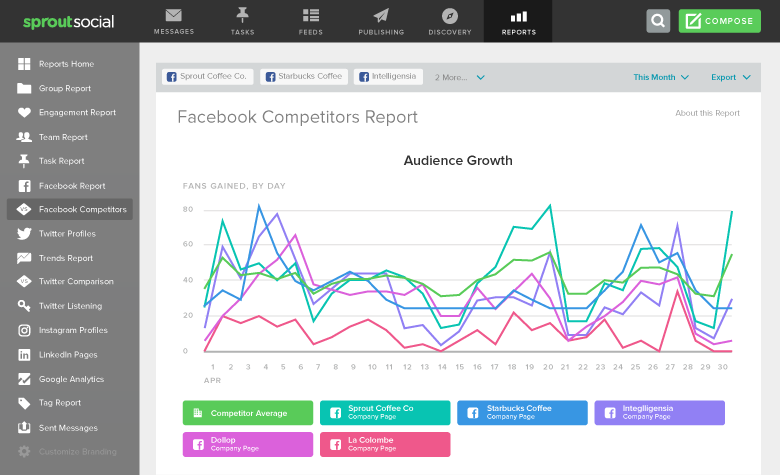 Sprout’s Facebook Competitors Report enables your brand to track fundamental metrics for any Facebook Page and benchmark these metrics against your own Pages. With this new report—available on Corporate and above plans—you can understand how your brand growth and engagement on Facebook compares to competitors. In addition to benchmarking your success against competitors, you can measure relative social performance across a portfolio of related brands or products. Learn more about how you can use this report for Facebook competitor analysis below. The Audience Growth section of the report includes a graph that enables teams to visualize Fan growth by day. The accompanying chart breaks out Fan data and trends so you can dig into your Page’s overall growth and analyze the performance of your competitors. 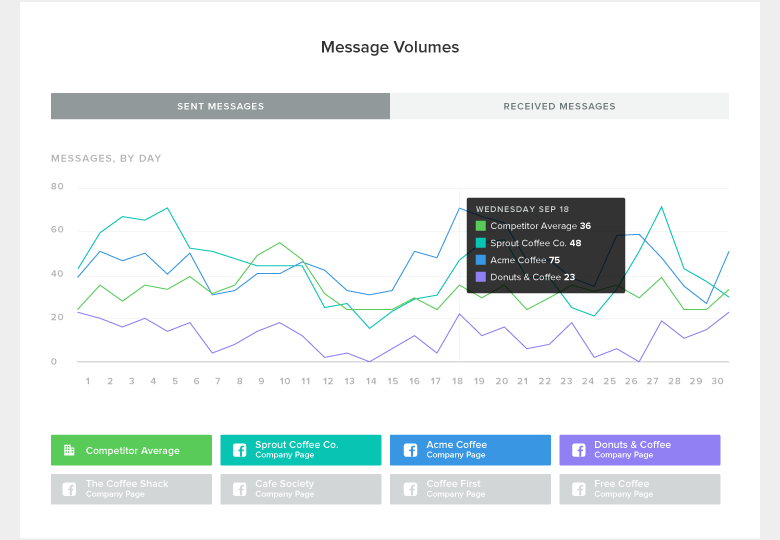 The Message Volume section enables you to better understand inbound and outbound message volume and engagement. The graph filters sent and received message metrics by day so you can visualize peaks and valleys to better understand when your audience and social team is most active. The chart includes overall volume, breakdown of post types, overall engagement and engagement per post. Each section of the report includes an aggregated average of each Pages’ social metrics. Your team can use this social data to set a baseline for your brand’s audience growth and publishing and engagement goals. Share Sprout’s PDF export with your CMO to better demonstrate how your Page(s) have been trending against the industry average. 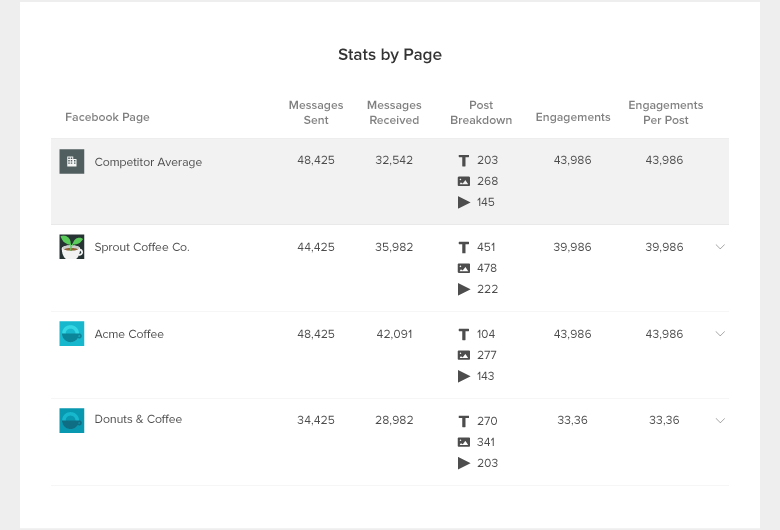 Use the insights within the Facebook Competitors Report to indicate your team’s ability to achieve KPIs or demonstrate a need for additional resources to adequately compete with industry standards. Be on the lookout for more reports focused on competitive analysis and provide any feedback in the comments.